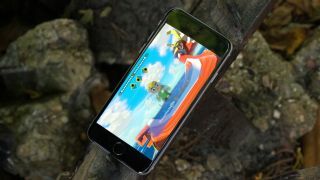 If Apple starts making its own GPU, what will it mean for iPhone gaming? It's long been rumored that Apple plans to start doing its own graphics hardware. This week it was reported that the company is in talks to buy Imagination Technologies, the company behind the PowerVR graphics tech currently found in iPhones and iPads, before Apple stamped out the fire. Still, Apple did confirm that conversations had happened, which alone is interesting and adds further speculation the buzz that Apple plans to bring 3D graphics in-house. Would doing so revolutionise gaming or even enable technologies like virtual reality on Apple's mobile devices? Could we be looking at console quality gaming - even virtual reality gaming - powered by iPhones and iPads in the next few years? In-house graphics technology could also hint that at a radical new iOS interface in the works. We might be getting ahead of ourselves, but going by rumours, this GPU is being developed for Apple's mobile devices. In other words, iPhones and iPads. After all, Apple already designs its own processor or CPU cores. With 3D graphics becoming ever more important, doing it in-house is an obvious next step for the world's biggest tech company. Since we're talking iPhones and iPads and not desktop or laptop Mac systems, the graphics tech in question isn't a separate chip, but a graphics unit that's integrated into a larger SoC or system-on-a-chip - a chip like the A9 SoC that powers the current iPhone 6S, for instance. The A9 has a pair of Apple's own 'Twister' CPU cores, compatible with the ARM instruction set used by the CPUs in most smartphones but designed in-house at Apple. The graphics in A9, however, is bought in from Imagination Technologies in the form of a so-called six-core PowerVR 7XT GT7600 GPU. Thus the quickest route for Apple to have full control over graphics is to simply buy Imagination. But why bother in the first place? The first thing to understand is that designing computer chip circuits is very, very difficult. That's why it was only with the A6 chip in the iPhone 5 that Apple introduced its own CPU cores. Prior to that, it had licensed CPU core designs wholesale from ARM. Graphics units are at least as difficult to design as CPU cores. Some would argue they are even harder. That's why there are so few companies that do it and why even some of the mightiest tech firms have failed. A few years ago, Intel was planning on getting in on the PC graphics game with its 'Larrabee' technology. But as the launch of Larrabee approached, it became clear that even the might and know-how of Intel wasn't going to be enough. Larrabee couldn't compete with the graphics chips from the two big specialists in PC graphics, AMD and Nvidia. So Larrabee was never released as a graphics chip and became a co-processor for specialised industrial computations. The failure of Larrabee is one of the best examples of how graphics has become so specialised; it's very hard for new companies to enter the market. The likes of AMD, Nvidia and indeed Imagination Technologies have decades of experience and intellectual property behind them. Indeed, look around the industry, and you'll find plenty more evidence of the challenge posed by graphics architectures. Samsung buys in ARM's Mali-T760MP8 graphics for the Exynos 8890 chip in the new Galaxy S7 smartphones, for instance. Again, even a company as massive as Samsung doesn't fancy doing its own graphics. Then there's Qualcomm, whose Snapdragon chips are found in all manner of mobile devices including numerous Android smartphones from HTC and others. Qualcomm has its own 'Adreno' graphics technology in its chips. But dig deeper and you'll find the Adreno architecture is derived from the ATI Imageon tech Qualcomm bought back in 2006. So even Qualcomm hasn't created its graphics tech from scratch. Of course, as one of the wealthiest companies on the planet and with no shortage of bright minds, if anyone can jump into the graphics market it is surely Apple. But now that we know how difficult it is to get into graphics, the next question is why Apple would bother. The rewards would have to be substantial, right? Part of the motivation, as ever, will be money. The money being made by Imagination Technologies from its technology inside Apple chips is money that Apple could be making for itself, or at least keeping for itself. That part is simple. But there's also a technological angle, and this is where things rapidly become very complex. For starters, there's the problem of manufacturing chips. All the various segments of an Apple SoC have certain properties and must be compatible with the manufacturing process of the whole chip. Buying in large segments of the chip means Apple currently has less control. It may have to wait on suppliers to optimise their circuits for its preferred manufacturing process, for instance. In extreme cases, poor design of one segment can compromise performance of the whole. Bringing the graphics in-house also means it can be designed to be good at the things Apple cares about. Apple's CPU cores are a good example. While most of the industry is chasing larger and larger core counts, with eight-core CPUs in phones now the norm at the high end, Apple prefers two very powerful cores to lots of less powerful cores. The only way to achieve that was to design its own cores. Of course, the beauty of buying Imagination Technologies and its PowerVR tech would allow for a seamless transition. Apple's iPhone and iPad chips already use PowerVR technology, so there will be no painful transition. Just full control of how the PowerVR technology progresses in future. There's also a good chance Apple's priorities regards graphics will be substantially different to the rest of the smartphone and tablet industry. One intriguing idea is a brand new interface for iOS based on advanced graphics acceleration. Graphically, iOS has been rather stagnant. By definition, if you're using the same off-the-shelf graphics hardware as everyone else, you can't do something radically different. Gaming is the other obvious benefactor of improved graphics and also, arguably, one of Apple's few remaining weak spots. A lot of games are played on Apple devices, but Apple is hardly at the forefront of gaming technology. Obviously more powerful graphics would make iPhones and iPads better for gaming. But you could also imagine Apple taking aim at the two big makers of games consoles, Sony and Microsoft. Both of the current games consoles are fairly new so will be around for some years yet. And neither has particularly powerful graphics compared to a high-end PC graphics card like and Nvidia GeForce GTX 980. So it's not impossible to imagine Apple squeezing in comparable graphics performance to the current consoles into a future iPhone and iPad chip. Then imagine linking that iPhone or iPad to a large display via a wireless interface and you have a high quality games console in your pocket. Something like that will almost definitely be possible in the next five years, so it seems like a case of when, not if. The final possibility is more speculative: could Apple be planning virtual reality capabilities for its future mobile devices? It would be a hugely ambitious plan, but to pull it off would require seriously long term planning. Getting a head start on the graphics now would be critical. Of course, if it is happening, it's mostly likely a combination of much or all of the above. In other words, there are a lot of compelling reasons for Apple to bring graphics in-house. Exactly when Apple might launch its in-house graphics technology is very hard to say. It's even possible that it may eventually turn out to be a failed experiment, just as Intel failed with Larrabee. But we think the rewards for Apple are so big, it won't give up until it has succeeded. With that in mind, we'd expect to see something dramatic in terms of new graphics from Apple's new in-house efforts within the next two generations of iPhone and with it gaming power that's in the same ballpark as current consoles. Exciting times.